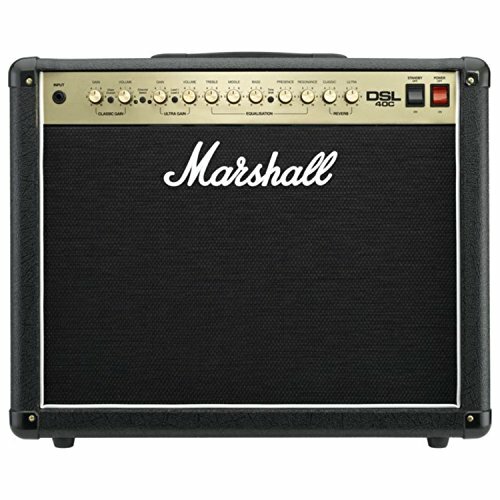 MARSHALL 40W all valve 2 channel 1x12 combo with Resonance, digital Reverb, Celestion speaker Marshall's DSL40C 40-watt guitar combo amp serves up definitive Marshall tube tone. The DSL series ruled for a decade, and it's back, with a tone moster combo that lets you dial up any classic Marshall sound you've ever heard. The new, all-tube DSL Series is surprisingly affordable, too - juicing your tone arsenal with massive power and all the best sonic qualities and features of both modern and vintage Marshals - in a portable and totally tweakable combo. From Plexi-style cleans to JCM800-esque snarl to liquid inferno high gain - you get it all with the Marshall DSL40C.